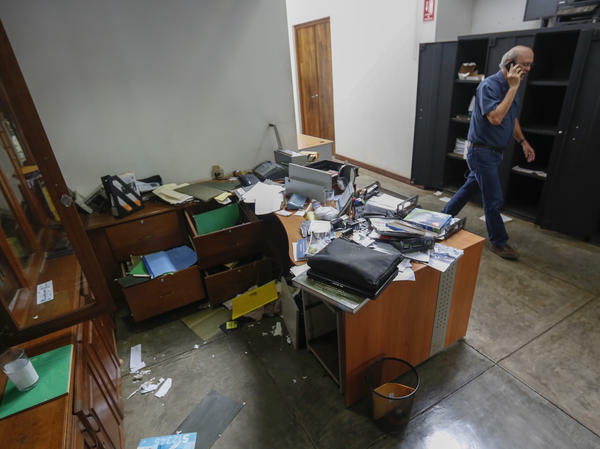 Carlos Fernando Chamorro, editor of Confidencial, walks through the publication's ransacked offices in Managua, Nicaragua, in December, 2018. Chamorro has fled the country, citing "threats" from the government. A leading Nicaraguan journalist has left the country following a police raid on his newsroom last month. Carlos Fernando Chamorro, editor of the online publication Confidencial, announced on Sunday that he has gone into exile in Costa Rica, citing suppression of independent press under Nicaraguan President Daniel Ortega. "Faced with these extreme threats," he wrote in a column in Confidencial, "I have been forced to adopt the painful decision to go into exile to protect my physical integrity and my freedom, and above all to be able to continue to exercise independent journalism from Costa Rica, where I am at this moment." Confidencial will continue to operate, Chamorro said, though he plans to cut back the nightly television program he also hosts to just one show each week. His exile comes as the Nicaraguan government has grown increasingly repressive, according to international observers, with crack downs on human rights groups, anti-government demonstrators and members of the press. More than 300 people have been killed since protests broke out against Ortega last spring, with hundreds jailed, according to the Inter-American Commission on Human Rights. The United Nations says security forces have carried out extra-judicial killings and enforced disappearances. The crackdown on independent media appears to have escalated last month. Ortega's government raided at least two news organizations in December, including the offices of Confidencial in the capital city of Managua. Police shut down the television station 100% Noticias and arrested two of its journalists, Miguel Mora and Lucía Pineda, charging them with inciting terrorism. The government has also stripped nongovernmental organizations of their legal status and thrown out international monitoring bodies. Ortega loyalists in the country's congress have alleged that Confidencial, and several nonprofits, supported last year's protests that increasingly sought to drive Ortega from power, according to The Associated Press. The government has called those protests a coup attempt and described people who took part in the demonstrations, which often turned violent, as "terrorists." After police occupied the Confidencial newsroom and seized its equipment, journalists working in different locations kept the website running, Chamorro told NPR earlier this month. He said the departure of international groups from the country had left him, and his staff, without protection. "It's very, very difficult to work under these conditions of persecution," Chamorro told NPR. "But we have the commitment to do it until the last moment in which we're able to do it." The Committee to Protect Journalists has called on the Nicaraguan government to respect freedom of expression. "The office of the president, which exerts control over almost all aspects of government, must order police to stop raiding newsrooms, return all seized equipment and documents, and allow news outlets to work without fear of violent reprisal, interference, or arrest," the organization wrote in a statement earlier this month. Chamorro had previously insisted he would stay in Nicaragua, The Guardian reported. But when he spoke with NPR in January, he was contemplating leaving the country to work from abroad, as other Nicaraguan journalists have done. "We definitely are much more useful for the Nicaraguan society free than in prison," he said. Chamorro, a well-respected journalist in Nicaragua, comes from a family widely known for fighting censorship. His mother served as president in the 1990's. He wrote on Sunday that he has been welcomed to Costa Rica by the government of President Carlos Alvarado Quesada, who has condemned Nicaragua's "persecution of the press." Last week, Nicaragua's most-widely read newspaper published a blank front page, protesting an impounding of printing materials by the government that has lasted for months. For the second time in a week, a Latin American Supreme Court justice has denounced a left-wing authoritarian president. This time the country is Nicaragua – and this time the judge is calling the regime "a state of terror." Immigrant caravans – and family separation. Venezuela and Nicaragua rocked by refugee and human rights crises. Someone not named Castro becoming president of Cuba; Brazil and Mexico electing populists as presidents – one of them with a big reputation for sexism. But women surging big at the polls, too. President Donald Trump is signing into law a bill to cut off resources to the government of Nicaragua and provides sanctions against countries that assist the Central American nation.